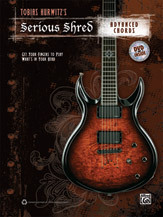 If you admire guitarists who combine killer technique with exciting musical ideas, the Serious Shred series is for you. Each title features lessons from renowned shredders and educators, and includes licks and examples in both standard notation and TAB---all combined in a book and DVD package for a complete learning experience. Learn what you need to know to become the best player possible, straight from bona fide shred virtuosos. In this book, shredder extraordinaire Tobias Hurwitz gives advanced lessons on chord progressions, covering concepts like root-4 voicings, altered dominant chords, extended intervals beyond the octave, altered chords, and more. Hurwitz will take your technique and soloing chops to new altitudes with his crystal-clear demonstrations of these advanced concepts. The included DVD features awe-inspiring demonstrations by Hurwitz himself.